Who Should Buy a Construction Stapler? What Makes a Good Construction Stapler? Construction Staple guns are extremely useful tools to have both around the house and on construction sites. They are a heavy-duty tool that can be used in a variety of applications. The tool is commonly used to lay sub-flooring and carpeting and is often used for installing roofing shingles and attaching fencing. Construction staplers are built with a heavier gauge than traditional woodworking staple guns and are generally either 16 gauge or 20 gauge. The staples are also longer which enables them to be used on thicker surfaces. Because of the increased demand and depth requirements, construction staplers need to have more power than a standard staple gun. Staplers have been around for centuries and have been used on various materials from wood to metal or even stone. In order to get the staple securing in the material the staple must be shot with a lot of force. This makes the pneumatic stapler the best in terms of power to get the staple fully through the material you are working with. Pneumatic construction staplers are designed for the serious handyman or the professional construction worker. Air staplers work with an air compressor reducing the amount for force you must apply without giving up the power needed to be effective. They can be used for both small and large projects. 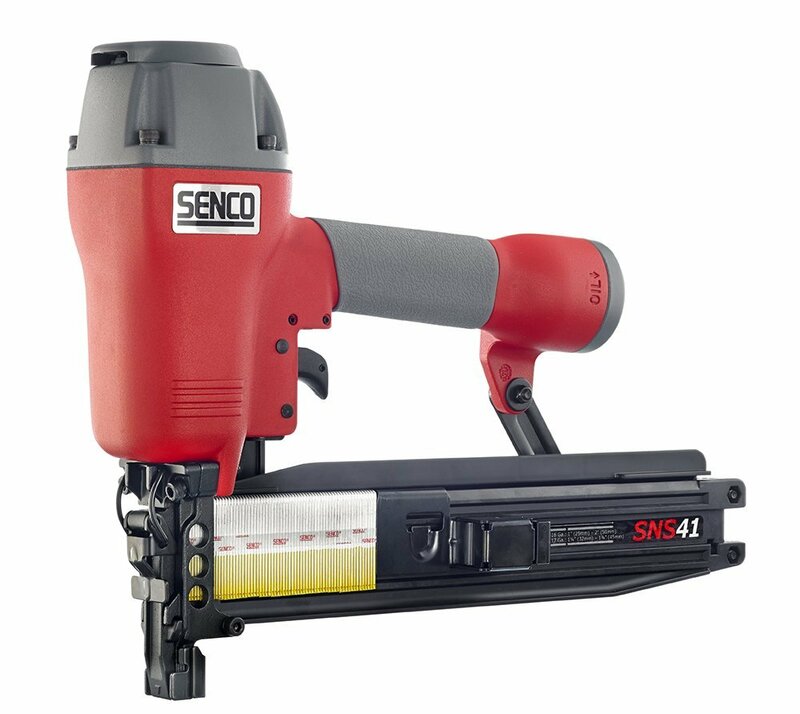 After testing and evaluating the most popular construction staplers on the market, the Senco SNS41 rose above its competitors in both quality and value. Its lightweight and powerful design allows you to use it in all necessary applications from roofing to fencing. It only requires a 100 psi for most applications and will effectivly get the staples all the way into the material you are working with. This makes it our top pick. 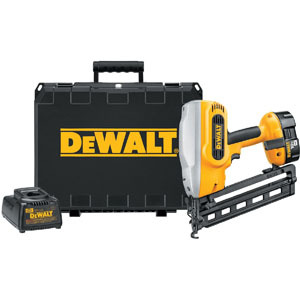 Construction staple guns are extremely useful for a wide variety of tasks. Anyone planning to do renovations or home repairs will benefit from having a construction stapler in their tool box. Projects like decking, fencing, roofing and other similar projects will run faster and smoother with a quality staple gun. Professionals and serious do-it-yourselfers like to use construction staplers to install drywall, flooring, and carpets. They can be used on various materials including wood, metal, stone, drywall and other hard materials. A good quality construction stapler will make your job easier, faster and more efficient. 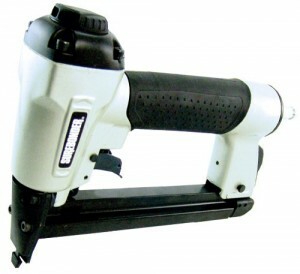 We strongly recommend a pneumatic staple gun for any major construction or renovation. Construction staplers come in three basic types: manual, electric, and pneumatic. Manual staple guns are great for small home projects. They are easy to use and come in several styles and are relatively inexpensive. Most manual guns require you to squeeze the handle each time you want to insert a staple and require a lot of hand power and energy. Manual staplers only have the power produced from squeezing the gun and will often result in the staples not driving completely into the material you are working with. When this occurs, you may have to finish driving the staples in with a hammer. Manual staplers are good for light duty crafts small household jobs. They can be used for home decorating, fabric tacking, installing window or door screens and of course small upholstery repairs. For heavier jobs you will need either an electric or pneumatic stapler. Electric construction staple guns are either battery-powered or must be plugged into an electric outlet. Electric models have triggers that only require light pressure, so they are easier to operate than the manual designs. Most electric staplers are adjustable to accommodate various fastener lengths. Most also have a safety feature which prevents the gun from firing unless it is in place and pressed down tightly. Still, any electric staple gun should be kept out of the reach of children. They are more expensive than manual guns and are more appropriate for larger projects. These are mid-level guns as far as power and versatility and are often not strong enough for construction work. An electric, corded stapler has the disadvantage of not being able to go wherever needed, without extension cords. A battery-operated stapler will need to have the battery recharged consistently. Electric staplers are not as powerful as pneumatic staple guns. Pneumatic staplers have the power, speed and precision needed for heavy-duty jobs and are the most popular choice for both handymen and professionals. The most important consideration in choosing a stapler is how well this stapler matches its intended use. Another factor in buying a staple gun is the size and type of fasteners you will need for your most common applications. Staple sizes are expressed in inches or millimeters and describe the height of the tines and the width of the crown. The more sizes and types of fasteners, the more versatile, the tool will be. Fasteners should interface well with your project materials. Light weight, small fasteners would be inefficient stapling materials into wood or plastic. Construction staplers are designed to use heavy gauge staples, with longer tines than standard staples. When buying a construction staple gun consider how easy it will be to operate with one hand. Your other hand must be able to secure the material to be stapled. An ergonomically constructed stapler will make it easier on your hands and allow you to work for longer periods of time. Also consider the weight of the gun. Construction staple guns range from 4 to 6 pounds. A smaller size is more useful when getting into tight corners. Jamming is a common problem that happens to staples and finding one designed to reduce jamming will speed up your work and reduce frustrations. The pneumatic construction stapler is both versatile and powerful and can accomplish many heavy-duty tasks. A pneumatic, or air stapler requires an air compressor but enables the stapler to have more power than other options. These are lighter in weight and easier to handle than electric or manual options. 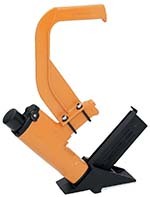 Some pneumatic construction staplers accept continuous rounds or magazines of staples. This can save a great deal of time reloading the stapler. They also tend to have a safety function to prevent misfiring. We began with extensive research of available products on the market, and narrowed the list to the top construction staplers based on features and value. After careful consideration, we reduced the list for further testing by studying the top brands and models. We evaluated how well the staplers worked, the features included and what others who use the product are saying. Then we read home improvement blogs, tool websites, and got opinions from specialist, craftsmen, tool companies, and home users, to establish which one should receive further review. We then searched Amazon for the best construction staplers that contain the most sought after features at the best price. 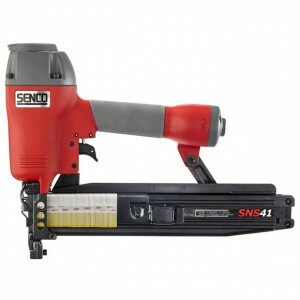 The Senco SNS41 stapler is the ideal tool for any heavy-duty job. It is designed for replacing flooring, roofing or raising a fence. If you need a powerful stapler, this is a top quality tool to use. Its pneumatic design uses an air compressor to reduce hand fatigue and increase speed and power. Generally, 100 PSI is all the pressure needed to get the staples fully into the material you are working with. You can successfully shoot staples into heavy material like sheathing, lathing or fencing. It offers the ability to adjust the driving depth of the staple by increasing the air pressure up to 120 PSI if needed. The Senco SNS41 has a very nice feature added to the trigger, in that you don’t need to pull the trigger to operate it. Each time you want to drive a staple, you can keep the trigger pressed and just bump the gun into the wood. This is a great help in speeding up the work. The staple gun is lightweight, weighing only 4.6 pounds, making it easy to hold for long periods of time. The gun has an adjustable exhaust with a 360-degree axis, so regardless of your working position, you can drive the air oil and condensation away from yourself, giving you enough comfort for larger projects. You can drive up to 14 staples per second and you are able to adjust the drive depth to accommodate the material you are using. It can accommodate staples from 1 to 2 inches providing the size range for most any project you will come across. The stapler has a EZ-clear latch that makes it easy to clear jams when they occur. The handle is ergonomically designed for greater comfort. The unit is easy to reload and has a quiet operation compared to other staplers in its class. This construction stapler is lightweight and compact. It has a comfort grip, which reduces vibration and fatigue. It also comes with a one-year warranty. If you are looking for more power and faster operation, the Bostitch MIIIFS pneumatic floor stapler is a high-powered unit that will fit the job. This stapler is compact and designed for rapid installation. It can shoot the staple into place by simply resting the nose squarely against the work, the direction and angle of the staple is automatically aligned. This stapler is easily adjusted for different thicknesses of material and different tongue positions. 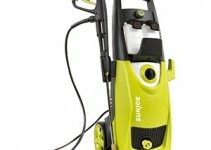 The tool has an aluminum body for durability and lightweight. It comes with an extra wide posit a splayed for added stability. It must be used within air compressor with an operating pressure of 60 and 100 PSI. This provides 420in./lbs. Of driving pressure. Its long-grip handle allows you to maintain a comfortable posture when working. The tool includes an adapter foot and extra wide baseplate. It also comes with a 7-year warranty making it one of the longest warranties in the industry. Always unplug the unit from the air compressor before turning it towards anyone. Never leave it plugged in or connected to the air hose when not in use. Maintenance includes lubricating the gun as directed in the manual and cleaning the gun after every use. The right tool for the job can make a tremendous difference in both the time it takes to complete the job and the quality of the finished work. Construction staplers offer features that cannot be found in other tools, making it a must have for many projects.